September 27th, 2013 – Goodbye expensive data roaming costs. Hello Goodspeed - internet access abroad for one fixed daily cost. Uros today announces that it has extended its Goodspeed service offering low cost, high volume roaming data to the USA. 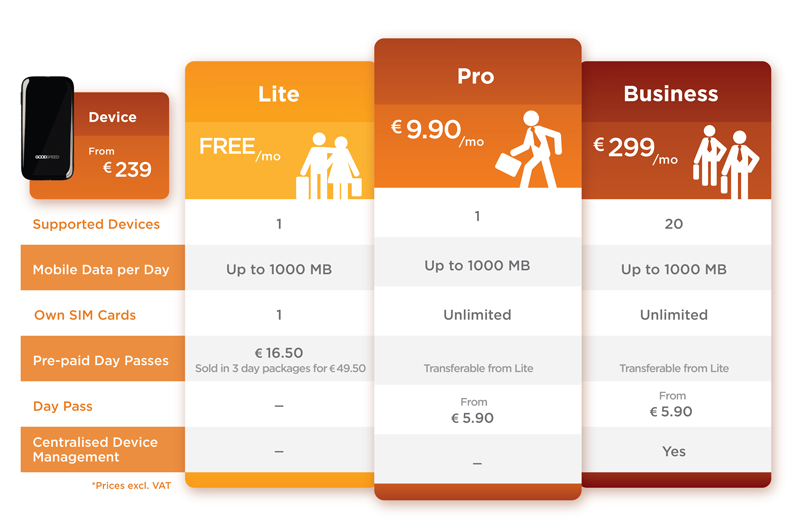 Goodspeed users can get virtually unlimited mobile internet access abroad from as little as €5.90 per day (approx. £4.90). For business travellers that visit multiple countries, Goodspeed offers fast internet access for one predictable daily cost. Goodspeed connects up to five Wi-Fi-enabled devices, such as smartphones, tablets, laptops and e-readers, delivering reliable access to the internet and corporate LAN for the business person on the move. At the same time with the major extension to the service coverage Uros also announces new pricing packages to bring the Goodspeed service available to a larger crowd of customers. The new, 3-tier pricing system with Lite, Pro and Business options will be available during October 2013. The Lite package without monthly line rental costs and with pre-paid day passes is suitable for more casual travellers. The Pro version is ideal for a small business with one regular traveller, whilst the Business package featuring centralised payment and device management for up to 20 Goodspeed devices under one account is directed to companies with several business travellers.